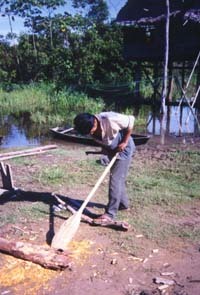 I find these paddles or remos along the Amazon River in the Peruvian Rainforest. I move along the shoreline in my dugout and barter with local fisherman for the paddles they are using. These paddles are traditionally made from the buttress roots of remo caspi, Aspidosperma excelsum. Remo caspi, or literally paddle wood, is a lightweight but strong wood perfect for paddles. Unfortunately remo caspi is also an excellent building material and it is being depleted in many places. In its place I see increasing use of other woods for paddle construction, sometimes even fine mahogany. 9 inches across the blade.